Though the weather outside may be frightful, making DIY jewelry is always delightful. You don’t need a place to go because you’ll want to be at home making these DIY projects inspired by snow! I am always so excited about the first snowfall of the year. Nothing is as beautiful as those tiny snowflakes floating through the air. A white Christmas and a winter wonderland are what people hope for during the holiday season. This holiday season, you can create gorgeous jewelry pieces that are as inspiring as the first winter snowfall. AllFreeJewelryMaking has compiled this list of Winter Wonderland Jewelry: 15 Snowflake Crafts and DIY Projects to provide you with DIY jewelry making ideas inspired by snowflakes. Beautiful DIY charms are lovely because they are multipurpose; you can add them to a bracelet, turn them into earrings, use them as pendants on a DIY necklace, or make them into homemade holiday decorations. For a charming pattern that is ideal for anyone who likes bead motifs, try this Shimmering Beaded Snowflake Pattern. 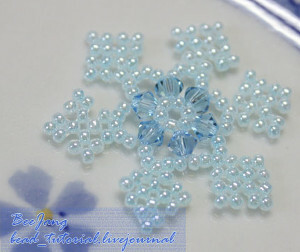 You could also create a charm as pretty as a picture of a winter holiday with this tutorial for Crystal Snowflake Charms. The possibilities are endless for these snowflake crafts made from adorable beading patterns. Wear one of these homemade necklaces to a holiday party, and you will be the shimmering star of the event. Look like a sparkling snow queen, and dazzle your friends with a Sparkling Snowflake Bead Necklace. 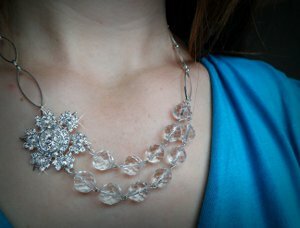 Not sure if this is the right stunning DIY necklace for you? We have a couple more options below. Celebrate the winter season by sporting little snowflakes on your wrist. 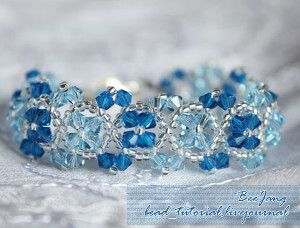 Feel like winter royalty with this gorgeous Snowflower Bracelet Pattern. This pattern vividly captures the color and glimmer of ice. Want a rustic jewelry piece that is still glamorous? Try a Silver Branches Bracelet, and capture the look of snow on bare tree branches. If these homemade bracelets remind you too much of the chilly outdoors, try this Snowflake Friendship Bracelet Pattern instead. 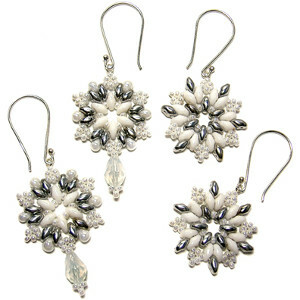 Don’t think we’ve forgotten about the dazzling snowflake earrings you can make! These Winter Wonderland Snowflake Earrings are exquisite; use this beaded snowflake earring pattern to make gorgeous earrings that are awesome for any occasion. Find more winter craft projects below and create stunning DIY earrings! All of these DIY projects are great ways to incorporate snowflake-inspired pieces into your homemade jewelry collection this season. If you need more holiday jewelry ideas, then check out AllFreeJewelryMaking’s collection of holiday earrings for every day of December, and make ornaments for your ears! What is your favorite piece of winter jewelry? Get Creative with Sensational Snow Craft Ideas! It’s finally starting to get a little chilly outside, so we at AllFreeChristmasCrafts have the cold on our minds! We absolutely love snow crafts, and part of why we love them so much is because they aren’t just for Christmas! Many snow crafts are great to leave up throughout the winter. After all, it’s always a little sad to take down Christmas decorations after the holiday passes, so why not craft something that can stay up through March? DIY snowflakes are easy and fun Christmas crafts. They’re perfect for the whole family because most of us have been cutting snowflakes out of paper since we were little! Snowflake crafts can range from the truly difficult to the truly basic. This Crochet Snowflake Garland is a little more difficult than simply cutting patterns out of paper, but we have tutorials for even the most basic snowflake crafts. 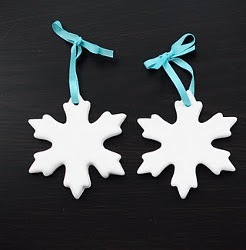 It’s true that no two snowflakes are the same, and these craft ideas are truly unique! Snow globes are completely classic Christmas decorations, and they are each snow unique! You can put anything you like inside the glass jar. From the traditional evergreen trees to protected family photos to even little figurines of cartoon characters, snow globes can be perfectly tailored to any home decor. In fact, they aren’t just for decorating your home! 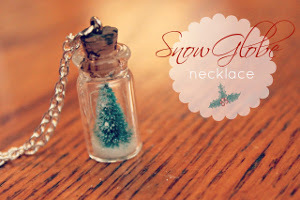 This Adorable Mini Snow Globe Necklace is a precious accessory for your next Christmas gathering! Learn how to make your own homemade snow globes with any of these fabulous tutorials. Snowmen are fun to build when the snow is perfect for packing, but what about when snow isn’t on the ground yet? And if the snow is too powdery, that’s no good for building snowmen, either. Keep snowmen around all winter when you make snowmen inside your home! These snowman craft ideas are great crafts for kids and for parents! Take these Salt Dough Snowmen for example. 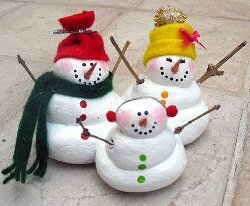 Mom can make the salt dough, and the kids can have fun sculpting the snowmen and adding faces, hats, and scarves! When do you take down your snowy Christmas decorations? Snow flakes are usually in order around the holiday season. The snowflake I am showing here will take a few days to complete from start to finish. It requires glue and glitter to turn the yarn into a hardened snowflake that can hang freely. It is beyond spectacular when you are done. 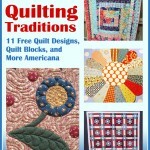 These are very much in high demand for giving away as gifts. They are so unique to themselves. This week’s Meet and Make designer is Katie Hacker. I’ve known Katie for years and I love making her designs. They’re fabulous AND the instructions are always SO easy to follow! I love reading her blog, too — KatieHacker.com. 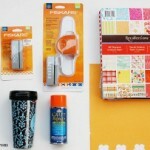 So I was thrilled when Katie agreed to be featured on the FaveCrafts Blog. I come from a crafty family. My parents owned a dollhouse and miniatures business called Dee’s Delights. The year after I graduated from college, I co-wrote my first book, Hemp Jewelry: It’s Knot Hard. I was a regular presenter for 12 seasons before becoming the host of Beads, Baubles & Jewels. Even though I’ve made a ton of jewelry, I wear the same necklaces over and over! 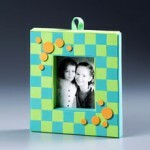 I design jewelry projects for a monthly kit club called Katie’s Jewelry Personal Shopper. These days, I’m listening to kids music by They Might be Giants. One of my favorite children’s books is Leonardo the Terrible Monster by Mo Willems. My kids are super ticklish, just like me. I keep honeybees at my husband’s family farm. Starting January 1st, I’m training for my second half-marathon. 1. Cut six 6″ lengths of wire and bend them in identical U-shapes. 2. Cut five 2″ lengths of wire. 3. Hold two U-shaped wires next to each other so the wires extending from the curve are parallel. Coil a 2″ wire around the wires to bind them together. Repeat for all of the 2″ wires. 4. To bind the last section together, cut a 4″ length and make a loop on the wire end. Hold the loop in the center opening and coil the wire to bind the sections together. 5. About 1/4″ from the coil, use chain nose pliers to bend each wire outward in a V-shape; repeat for each wire. 6. Next, hold the adjacent two wires together as one and pass them through a glass bead; repeat for each section. 7. Use round nose pliers to make a loop on the wire end, then hold it flat inside the jaws of chain nose pliers and turn your wrist to form a spiral; repeat for each wire end. 8. Cut a 4″ piece of wire and fold the end back by 1/8″ to form a stopper. Pass the wire through a glass bead. 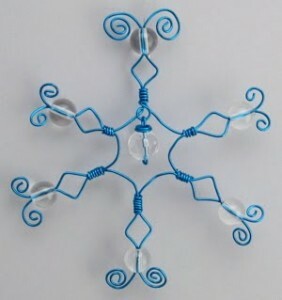 Make a wrapped loop to attach it to the center loop on the snowflake. The snow is on its way in Illinois. Tomorrow is Turkey day and I am so excited. We’re supposed to get a wintry mix so who knows what that will bring. With Christmas shortly to follow it’s time to bring out all your winter decorations and crafts. One of the easiest crafts to make are those cute paper snowflakes, they’re so easy to make. The only materials you need are a pair of scissors and multiple pieces of paper. You can also choose to add some glitz and glam like glitter if you wish. If you choose to add glitter you will also need glue. Fold a few pieces of paper in half and then fold it in half again. You then cut in any shapes you want. You can cut out triangles or cut a full circle then cut some more triangles, whatever you want it to look like. You then unfold it and they should all look the same for you to hang up. I love shiny and sparkly things so I would then paint some glue on the snowflake and then sprinkle some glitter on top of it. My favorite snowflakes are plain white, but you can use any color paper you wish for a fun winter wonderland. Also try a Snowflake Cookie Cutter Card! My favorite snowflake patterns are the crocheted ones. 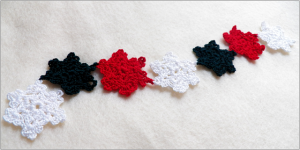 Check out these Beautiful Crocheted Snowflakes, you’ll love them.